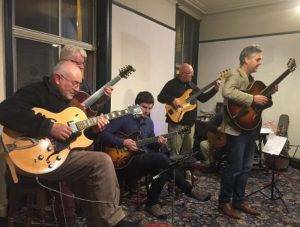 We’re a group of Jazz guitar enthusiasts and players that get together in Huddersfield. Why not join us? 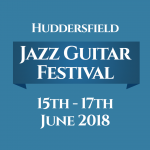 Huddersfield Jazz Guitar Society (HJGS) consists of a wide variety of jazz guitar enthusiasts. They follow, support, learn about and, perhaps more importantly, have the opportunity to actually play the music that they love. Playing ability varies, from the novice to full professional, and performance opportunities range from solo to duos, and larger groups. HJGS also stages occasional workshops by its professional members, and visiting artists such as Howard Alden (USA), Nigel Price, John Etheridge, Nick Meier, Darren Dutson Bromley and Adrian Ingram.Regular projects, such as specific composers’ nights, solo guitar nights, accompaniment, improvisation etc. are features of many meetings, (HJGS has booked saxophone and bass players especially for these projects) and the society also funds frequent concerts by top players. HJGS meets on the first Tuesday of each month at the Rat & Ratchet in Huddersfield.